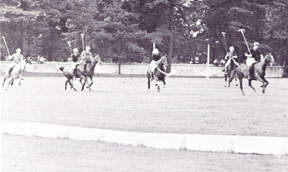 The Green Sixteen: This was the first game and the first team for the Montreal Polo Club. The oldest polo club in Canada was the Calgary Polo Club and it was here and at High River that English officers and gentlemen who had gone into ranching put together teams for leisure and sport in 1883. So popular was the sport that by 1909, the polo clubs in Alberta numbered 14 strong. Not to be outdone, the Montreal Polo Club was formed as early as 1901 and while there are no formal records, the teams from Montreal and the Back River Clubs (Rivière des Prairies area) played games before 1910 with other clubs in Quebec and Toronto. The Montreal Polo Club was also the first to play in the USA in Saratoga, then home of polo in that country. The first Montreal Club was formed in 1899 by members of the Canadian Hunt Club and a pool was formed to buy polo ponies and to cover other expenses. A train car load of shaggy horses from western Canada arrived, some saddle broke but little more. In Montreal the horses were selected, sent to a breaker and the fields were prepared at Mr. George Simard’s farm, he being the force behind the club. Their first game was far from brilliant and the ball was missed far more times than it was actually hit and after 30 minutes, the score was 0 to 0. However as the play got better, the membership grew slowly and there were games played against the team from Toronto though Montreal still lacked the experience of their competitors. After 1902, the teams began to move further afield for their games and went to High River in Rochester, NY, and although beaten, this experience greatly aided the Montreal teams in sharpening their game. The Toronto Club created an international tournament in 1903 and the International Cup would be awarded to the winning American or Canadian team annually. In 1904 the Eastern Canadian Polo Association was formed and although Montreal and Toronto were its only members, they were soon joined by the Back River Club formed in 1905 in Saraguay (now Cartierville, Quebec), and Kingston clubs. The Montreal Polo Club also moved from St. Lambert to Cartieville. Two years later polo got a real boost with the arrival of Messrs Robertson, Freeman and a Captain Pickering who had previous polo experience, and the club won most of its matches and became Canadian Champions for the season. In 1910, the Montreal Club disbanded and the Back River Club became the Montreal Polo Club on September 3, 1920. 1924: Watching the game in their Sunday best! WWI saw the end of polo for a few years as most of the players were in the military, but upon returning, the game started up again with fervor and great interest. Tournaments took place in the Thousand Islands; Pittsfield, Massachusetts; Smithtown, Long Island; Rochester, New York; Detroit; the Myopia Club in Boston, the East Aurora Club in Buffalo, the Loudinville Club near Albany, and Toronto. Aiken, South Carolina was a favoured winter retreat for many Montrealers during this time and the hostels were crowded with visitors and horse people who enjoyed the never ending round of parties, dances, luncheons, dinners, picnics, and of course polo games. The games attracted huge crowds and got press coverage in the papers. The Montrealers who were there never went as a team but they played frequently with other teams and top ranked players, made contacts for future games and bought polo ponies. Those were the days! Sometimes polo matches and players came from most unusual circumstances. After WWI the American and British West Indies Squadron was stationed in Bermuda, they sent a flotilla that went up the St. Lawrence River to visit Canada annually. 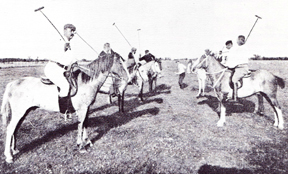 As there was an active Royal Naval Polo Association they always managed to put together teams on borrowed polo ponies to play with local groups 3 or 4 times during these trips. In looking at a list of team members and at the polo photos from the past, it is clear that the love of polo ran in families. Initially it was family, friends and neighbours who watched the games, and children were also included. Reverand William Morrison who was official timekeeper for the games as well as an adept pony picker and trainer, allowed the children to ring the bell to signal the end of each chukker. Spectators, then as now, swarmed the field to replace the divots during intermission. Matches for trophies attracted huge crowds and by charging .25 a person and $2.00 per car in the early days, the importance of trophy matches elevated them in spectators’ eyes and enhanced their value. The press was also interested in these higher profile matches and the Montreal Star, The Herald and The Gazette sent sports reporters to cover the competitions. As early as 1903 saw polo matches being played for charity and the Montreal General and Notre Dame hospitals benefited from a game that saw 16 train coaches arrived from Montreal to the polo grounds. 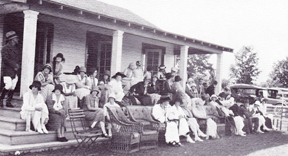 Spectators strolled about during and between events and refreshments were served in the Victoria Golf Clubhouse. When out of town teams arrived to play, or teams went to out of town matches, a whirlwind of social activities were planned and dinners, teas and luncheons were organized. The teams travelled by trains: the ponies and their grooms went first, the players and their wives followed. After the end of WWII, polo never recovered in Montreal the way it had after WWI. Lifestyles had changed, families no longer kept stables full of horses, and the grandfathers or wealthy fathers who had financed the young polo players were often dead. Polo disappeared from Montreal and from many other provinces and American states for a whole generation. Polo in the Montreal area got a new lease on life in the 1980s thanks to American Fred Choate who moved from South Carolina to Montreal and his love of the game saw it renewed in the very horsey area of Hudson, about 40 minutes west of Montreal. A small but keen group formed the Lake of Two Mountain Polo Club and Dr. Gilbert Halle converted some of his property into polo fields. Later the name was changed to The Montreal Polo Club, and the club and the sport was once again revived and revitalized for a while. Sadly it disbanded about ten years ago and exists today in the history books alone! I travelled to the Hudson area in the late 1980’s and early 90’s and thoroughly enjoyed Playing with Dr G Haile, Don Pennycook , Julian Allard and many more . As the level of play increased and professional players were brought in from other countries it made it difficult to compete . It was one of the highlights of my polo playing experience over 17 yrs. I would have joined the club if it was still there. Alex, get in touch withDon Pennycook. They still play at the fields on Highway 201.